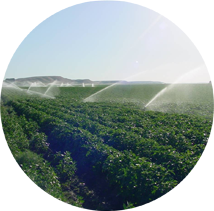 Sprinkler Application Rate: Sprinkler application rate based on nozzle diameter and spacing. Sprinkler Discharge Rate: Learn how to estimate a single sprinkler's discharge rate by setting up an experiment using two sprinklers, 4 cans and a measuring container. Traveling Sprinkler: Estimate the the total number of irrigated acres per hour based on lane spacing and travel speed.